This exciting and entertaining concert features the big numbers from an array of some 35 different musical shows. Many will be from musicals that are difficult for local theatre to perform, for example if they are showing in the West End or if there are particularly challenging production issues for the whole show. We can promise you great music, superb choral and solo singing, dancing and a slice of comedy. Under the co-direction of Julia and Richard Edwards and the musical direction of Roger Winter. Performances are 7:30pm each evening with a matinee on Saturday at 2:30pm. Tickets are £10 and £8 for concessions (OAP, students and children) with a family of 4 ticket at just £25. A discount of 10% applies to groups of 10 or more. There is no seating plan for this show as the tickets are unallocated. So please arrive in good time for the performance to get your choice of seats. If you are not a member of TMTG there is always the possibility you might like to join us and take part in the show. TMTG always encourages and is friendly to new members so if you are interested please contact the membership secretary whose details are available on this website. Next rehearsal will be on Wednesday 27th February at 7:30 at the Village Hall, Tytherington when we’ll run through more details for the show. Tickets are still available for this great concert. You can either get your tickets now using the “get tickets” tab above – it’s simple and there are no booking charges. Alternatively, you can pay on the door before the performance. Prices are £10 and £8 for concessions. Please look on “Productions” to find out more about the show. 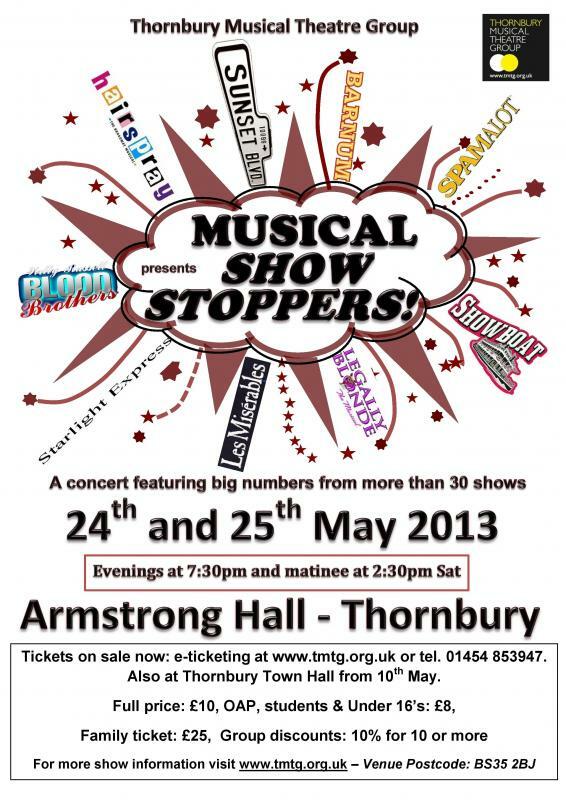 This exciting and entertaining concert will feature the big numbers from an array of some 35 different musical shows. Many will be from musicals that are difficult or impossible for a theatre group like TMTG to perform as shows for reasons such as; they’re running in the West End or they present major production challenges. We promise you great music, superb choral and solo singing, dancing and a splash of comedy from shows like; Les Mis, Barnum, Chess, A Chorus Line, Hairspray, Joseph, Spamalot, Phantom, West Side Story, etc.